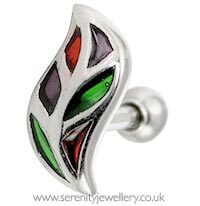 10mm high surgical steel vintage stained glass style leaf on a 6mm or 8mm bar with 3mm screw-on ball closure secured at the back of the ear. Please note: Due to slight differences in the threads these studs are NOT compatible with the 1mm gauge screw-on accessories. 1mm or 1.2mm gauge cartilage studs? 1.2mm/16 gauge is the most common size ears are initially pierced with but 1mm/18 gauge studs are good if your piercing have shrunk or were originally pierced with a smaller size. 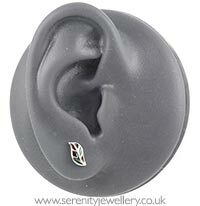 I wear these in my earlobes and they are great. My piercings can be sensitive but these don't irritate them at all which is awesome. I often leave them in overnight as well and because of the screw on backs I don't notice them at all. Plus they are a super cute design! Lovely but lost one of the backs already sad ! It's as pretty as it looks, it is not too large nor is it too small. 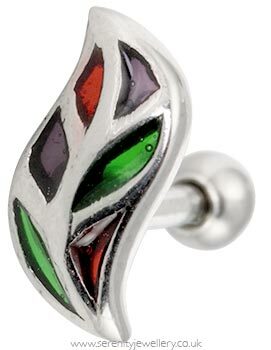 I have gotten compliments over wearing these alongside it's matching ear cuff earring, very happy!